class="post-template-default single single-post postid-5669 single-format-standard wpb-js-composer js-comp-ver-3.6.12 vc_responsive"
An All-time favourite of ours. Stunning tropical –look summer showstoppers providing an irresistible show of colour to brighten up your home. Here’s a tip: Mandevillas love to climb, whereas Dipladenias are their shrubby siblings! Mandevillas and Dipladenias hail from tropical South America. Australia was introduced to these beauties 30+ years ago and they have become garden stalwarts ever since for lovers of these gorgeous trumpet-shaped flowers. They flower non-stop from late spring through until the start of winter! You can’t get better than that – over half a year! As noted, it is important to decide whether you want a climber or a bush. One thing for sure is that both grow best in large pots. 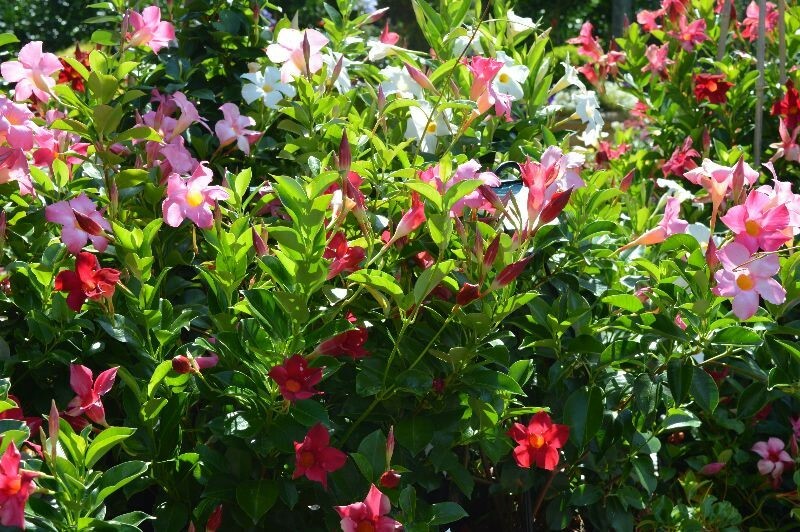 If it’s to be a Mandevilla with the slightly larger flowers, you will have to provide a climbing frame or support for the tendrils to latch on to. Dipladenias are bushier even though they will send out smaller tendrils that are easily snipped off to maintain bushiness. You might wish to provide a small stake/frame for these. We can’t emphasize strongly enough the great garden attributes of these Summer Beauties. They are so rewarding and easy to care for. Just make sure that they get loads of sun and are watered when the top 5 cm of premium potting mix has dried out. Fertilise with Osmocote 800 All Purpose and that’s about it! One or more totally happy plants!